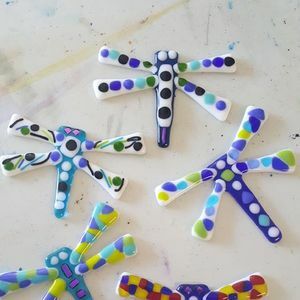 Come join the Funday Sunday and let's create colorful, fused glass dragonflies, just in time for Mother's Day! Included in your afternoon is lunch from Mulligan's and all of the materials to make 2 colorful dragonflies (one large, one small), I will also demo how to wire them to hang as a suncatcher ! Bring a friend, bring your tribe...the more the merrier! $45 per person Contact Michele Gould of Purple Cloud Studio for reserving your space(s) and payment information.